Friday, September 9 at the pep rally and the football game, love and support for children and families impacted by cancer was emphasized. 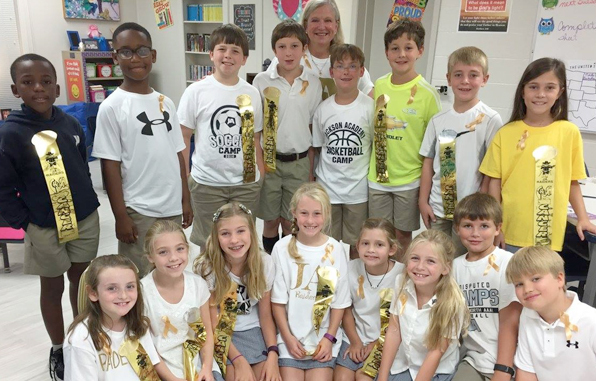 Gold clothing, special T-shirts, gold glitter, and gold ribbons abounded as the JA community rallied to recognize and honor the courage of children affected by cancer during Childhood Cancer Awareness Month. Go Gold is an outreach effort in area schools that helps educate students about types of childhood cancer and how they can help a classmate who is struggling with it. Go Gold also supports the Campbell Bulldog Fund, established to fund childhood cancer research at the Mississippi’s Children’s Cancer Center, located in Blair E. Batson Children’s Hospital at the University of Mississippi Medical Center. “We raised $1001.00 Friday night, and the goal was to bring awareness to our campus. The JA campus came together and proved once again that we are always better together,” said Paula Pratt, associate dean. Signs at the pep rally and game honored members of the JA community who have experienced cancer. Ben Sigler is one JA student whose name appeared on a sign. Blair E. Batson Hospital asked Ben to participate in the Go Gold campaign, and his parents attended the pep rally where they were amazed to see the entire student body painted in white and gold. Ben closed half time events at the game with a brief speech thanking everyone for supporting the Go Gold campaign. Go Gold was established by David and Jill Dale, who lost a son, Campbell, to cancer in 2015. The Dales are supporting efforts to “find new cures for childhood cancers and to educate children and adults about childhood cancers and their long-term effects,” according to UMMC’s website. View video from 16 WAPT of the JA pep rally on Jackson Academy’s Facebook page here.